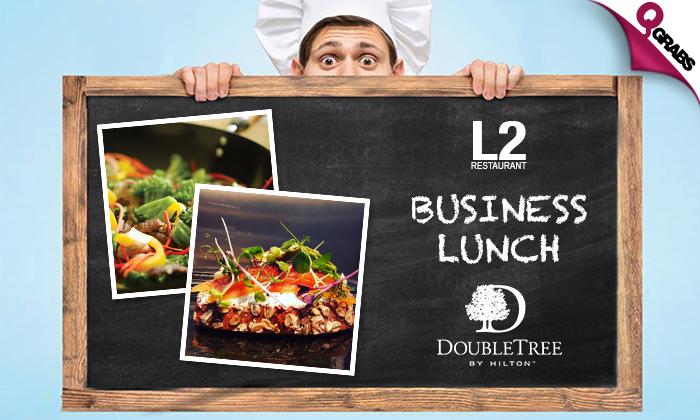 Business Lunch Buffet at DoubleTree by Hilton Doha! Enjoy a delicious business lunch buffet at the FACT dining award winner L2 restaurant at DoubleTree by Hilton. Salads include: Greek salad, mexican beef and bean salad, chicken & pomelo salad, along with oriental mezzeh, a make your own salad bar and more! Starters include: Spinach Fatayer, chicken spring roll and prawn crackers. Mains include: Grilled Beef with Thyme jus and caramelized onions, Wok fried chicken with cashew nut, crumb fried fish with tartar sauce, Dawood basha, mix grill, lamb Rogan josh, Dajaj Saniyah, vegetable samona, pasta and much more! Also available is a selection of international cheese, cold cuts, plain and fruit yoghurt, two fruit shooters of the day. Finish with mouth-watering desserts like Creme Brule, chocolate brownie, carrot cake, pistachio Esperanto, Berry Panna Cotta, white chocolate peanut crunchy, an assorted selection of Arabic sweets and dates and more to choose from! 50% off lunching the week away! DoubleTree by Hilton Hotel Doha Old Town. This new, 5-star international hotel in Old Salata offers an ideal base for business and leisure travelers. Enjoy spacious guest rooms and suites and a unique buffet restaurant. The hotel is situated just 12 km from Hamad International Airport and offers easy access to the Corniche, the banking district, the Museum of Islamic Art and the Emiri Diwan Palace. All of the spacious guest rooms offer panoramic city views through floor-to-ceiling windows. Feel at home with a wardrobe, a desk and complimentary WiFi. Upgrade to a stunning suite with views over the harbor or West Bay skyline, including an equipped kitchenette and spacious bathroom. Whether for a quick bite or a relaxed meal, the award-winning L2 restaurant will satisfy all your cravings with a selection of international specialties, sandwiches, coffees or freshly baked pastries. Sip cocktails by our rooftop pool and enjoy Mediterranean-inspired dishes with the city as a backdrop at our unique rooftop bar. L2 won Best Business Lunch in Doha 2017 and PURE took Best Bar in Doha 2017 from Fact Dining Magazine. Stay fit and focused with our spa, modern gym, steam room and sauna. The hotel offers two modern meeting rooms and a reception area, ideal for events with up to 40 guests.